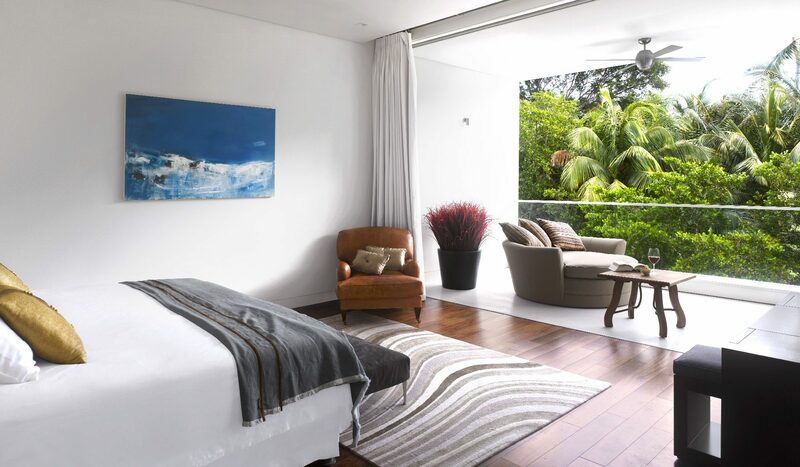 Our interior design brief was to create a luxury beach villa, that was both comfortable and with a flavour and influence from contemporary Miami beach style living; Our selection of finishes and furniture, many pieces being bespoke commissions, helped to achieve this look for our client. 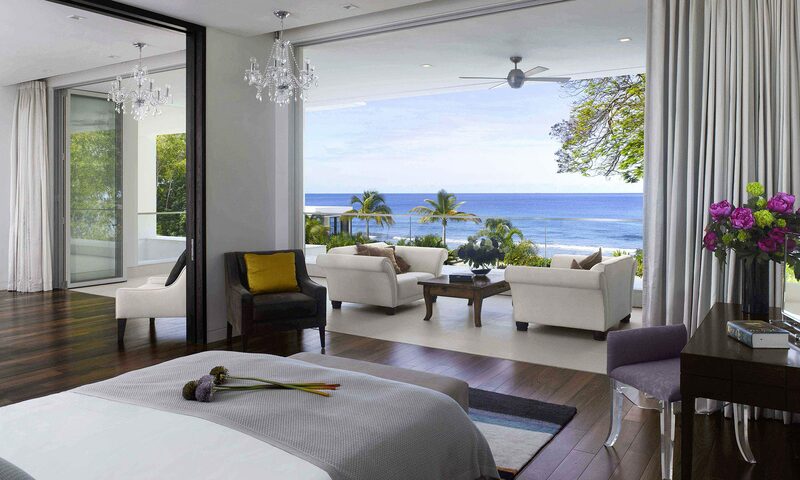 This contemporary ocean-side home enjoys a beautiful location right on the ‘Platinum’ West Coast of Barbados. 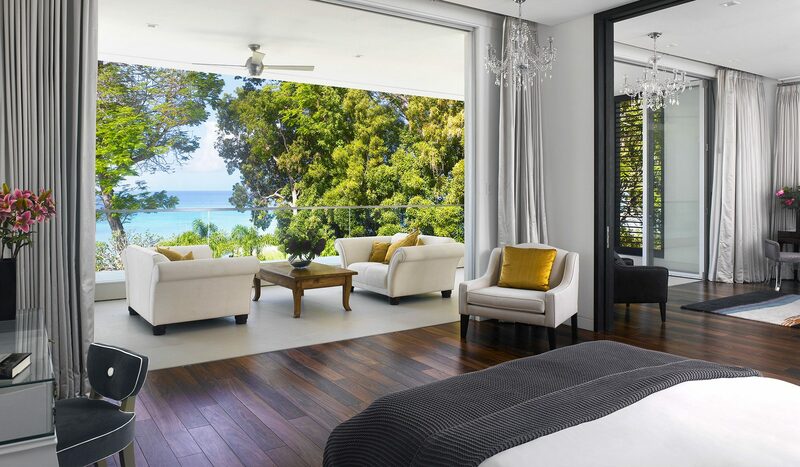 This ocean-side residence is all about open-plan, Caribbean lifestyle living; Generously proportioned rooms link to the poolside deck, the gardens and the beach beyond. Stylish swivel chairs give their users an option to turn to face the 15 metre pool, providing a light-filled transition between indoors and outdoors activities. The views from the lounge were carefully considered so that the deck-level pool creates a strong visual link to the ocean’s horizon, without interruption. A submerged dining table and built-in swimming pool seating provide a place to cool off, even at the hottest moment of the day. A guest powder room has floor-to-ceiling framed family photographs and the Deco styling of the large, faceted mirrors and vanity stand echo the Miami beach-front influence of this home. The space is a play of cool, glittering surfaces; a contrast – but also a connection to the mirage-hazy, sparkling ocean right outside. Entertainment and relaxation are important elements of the life of the house; An onyx-clad bar, complete with teppanyaki grill, forms a vibrant hub that links other open-plan spaces, such as a games area and informal family TV lounge. The spacious master bedroom gives the sense of being on board a yacht, with rich, exotic timber underfoot; fully opening glass doors afford both garden and sea views, also allowing breezes generated through slatted architectural blinds on the building’s eastern elevation to filter through the house, providing a comfortable environment that is augmented by the shade created by the projected terrace canopies on the west-facing side of the house. As the sun begins a final ‘slide’ towards the horizon of sea and sky, there is a moment of, ‘magic light’ that bathes the house in reflected gold; colours and mood change and soften, as the entertainment spaces indoors come into their own, whether this be sipping early evening rum cocktails around the bar, or dinner, taken in the beach-side cabana, with the gentle lap of the tide for company. Sea-facing, the open-fronted principal rooms provide access to the gardens and pool deck by way of oversized stepping stones, which meander to the ocean’s edge. In the heat of the day, sample the coolest lunchtime spot on the island! The structure of the sunken table and perimeter seating was designed and built in to the shape of the pool.